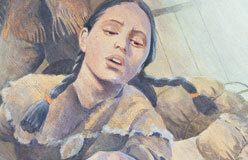 By the fall of 1804, Sacagawea was expecting her first child. 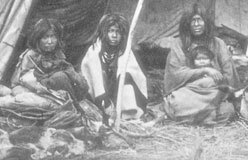 But that didn’t stop Charbonneau, a wanderer by nature, from asking Lewis and Clark if they would hire him as an interpreter. 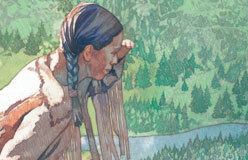 He knew Hidatsa and the sign language common among the river tribes. Lewis and Clark signed him right up. 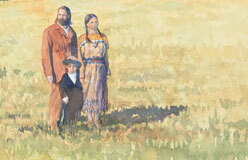 When they found out he was married to a Shoshone, they encouraged him to bring her along. 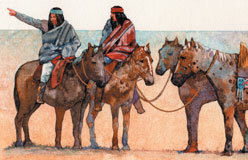 They had heard that the Shoshone had fine horses, which they would need later. 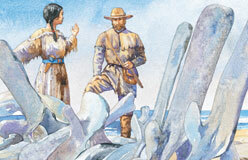 They figured that seeing Sacagawea would make the Shoshone more open to negotiations. 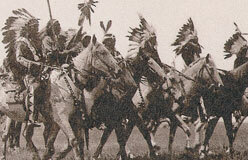 They also believed that any Indians they encountered would view them as peaceful. That’s because war parties never included women.